May be we'll start getting disappointed with GSM voice quality, it will be interesting to see as IMS networks are finally delivered over the next year or so with IP-Centrex service, if we'll see complaints for mobile call voice quality as people can more easily slide between their fixed office phones and mobile devices. Or will we see HD codecs creep into the mobile space as LTE kicks in. Who's gonna be the early carrier to adopt VoIP over HSPA QoS and wideband codecs, or are we gonna have to wait? Or wait - "Hold the Phone" - Haven't we got VoIP enabled devices already with WiFi and yes - applications like Fring (I have to use fring 'cos my mobile operator broke the SIP stack on my Nokia 5800! - But actually Fring is pretty cool too! ;o)). Pitty Fring doesn't have HD voice codec yet. It can't have escaped everyone attention that the Internet is 40 years old. The little video history is on National Geographic News. Well it nearly passed me by! Time for a visit to the Computer Museum in Manchester. In this entry I try to draw some comparisons between the PIKA, a home brew Atom and Grandstreams offering. Overall Price for similar ports. OK so back to playing with the PIKA and my latest edition an: Intel Atom Dual Core (330) Mini ITX machine. This is a small form factor Mini-ITX board in flat case, room enough for the 160G HDD and 1G RAM, but not enough room for expansion cards - even though the motherboard has slots. That said, this system is an absolute steal @ £189 ex VAT, combined with a Grandstream GXW-4104 or 4004 FXO/FXS gateway @ & £157 & £100.60 + VAT respectively = £289.50 for 4 ports FXS or £346 for 4 FXO. This now sits next to the PIKA system for a side by side comparison. Initial price comparison looks good PIKA comes in @£385 ex VAT + £82.50 for FXO or FXS or ISDN2e cards = £467.50 for 4 ports. Both the PIKA and the Atom + Grandstream, offer powerfail safe for the POTS ports, so on the surface the Atom wins on price. The other offering in this space is Grandstreams GXE5024, coming it at £393.60 for 4xFXO ports. Alas I haven't got one of these to play with but on the surface it seems to offer similar specs to the PIKA and home brew atom. Warranty and guarentee periods on most electronic of this type come in around 1 year or 2 years so you can expect them to last at least that long. Both are quiet for use in a desktop office environment and the PIKA can be hung on the wall. For Sheer simplicity in set-up for the end user, the PIKA LCD panel helps to see what's happening in the system and getting access to the IP address of the box is simple by passing your finger over the display it swaps to display the units IP address. So for system resellers with technical expertise, the roll your own can just about work out on price. For end users there's a hidden problem with the Atom system, the onboard Gig Network card is a Realtek that requires drivers from the Realtek website to run under Centos, the OS inbuilt realtek driver doesn't work. So my trusty Speedtouch USB 10/100 NIC from Thomson works out for getting the driver installed. So how much power do the PIKA and Atom systems take? I've been sitting watching my power meter and I can see a fairly consistent 62W out of the Atom system with no calls on the system, that's a little higher than I would have thought since the Atom CPU is claimed to consume only 8W. Then I turned off the LCD monitor! That's more like it - 36W. Now the PIKA - WOW - that's more like it! Just a nudge under 7W, with no calls in the system. for the sub £500 PBX offerings you've got some options. The PIKA is easy to set-up, very power efficient and comes with a variety of interfaces. Home Brew saves you a few quid, but creates the pain of having to compile you're own ethernet drivers. The Grandstream offering looks favourable too and even claims video support. But where it would fall down is on the list of features from numbers of conference rooms, IVR, ACD features and desktop CTI integration. Since the PIKA and Atom home brew can use Trixbox, you can add HUDlite and desktop screen pop for outlook contacts. I just spotted this gem: Skype is adding SIP as a connectivity method for calls to the PBX, now a this is interesting as a number of SIP to IP-PBX implementation are already appearing outside of the "official" skype framework. In fact in previous posts I mentioned my SIP/Skype gateway I got running based on the VoiceGear Connect gateway, not to mention Skype's work already announced and in Beta with Digium for the Skype channel driver. Let see what happens next, I guess the main advantage your own on Premise Skype gateway has is the advantage that the SIP trunk is local and under your control, whilst the Skype (encrypted) calls are passed through the perimeter, where as the Skype SaaS version just announced has to extend your SIP interface unsecured outside the enterprise. The kind People at PIKA Tech have shipped me their latest Asterisk appliance, which supports Analogue (FXO and FXS) and ISDN 2e (BRI) cards. It's based on Asterisk and the Digium Asterisk GUI, with recent support for FreePBX available (ftp://ftp.pikatech.com/outgoing/pads/extras/freepbx/freepbx-mysql-intl-2.0.2.5.tar.gz). The package arrived in a very neat box with an additional box containing a 4 port BRI (8-channels), a 4 port FXO card and 4 port FXS card. 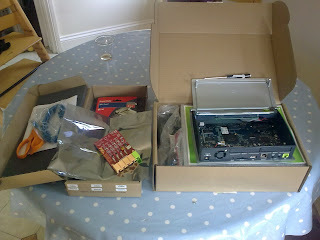 The picture above shows the intial unpacking stage of the main appliance. In the main box is the appliance, power supply (external mains transformer with EU and UK power leads), Cat5e cable and a rather curious serial lead with some ribbon cable attached (later I discovered this was for connecting to the internal serial port to connect to the console). The box also includes a rather neat little branded screw driver, which I initially looked at then put to one side thinking that's neat - not sure what that's for? Like all engineers I didn't look for any installation manual or user guide, I just went straight for the unpack everything, figure out where it goes later strategy. At this point I want to confess to being a FreePBX and Asterisk tinkerer and I also build my own Appliances based on the PIAF and Trixbox builds using MBX chassis with Solid state disks. So I was very excited to see what could be done with some real appliance engineering in a low power genuine solid state appliance for small offices. The appliance I put together are for up to 4xE1 (120 channels) 150 Extensions and 120 concurrent calls - but you pay the price for this size. The PIKA appliance fits the smaller office install around75 phones and 32 concurrent calls. My next post will take you through the fun of setting this little baby up in my lab. Wowha what happened to the last 3 months? So best laid plans and all.. I was going to spend sometime this new year building loads of cool VoIP and IM cost saving projects - but the day job kinda got in the way. So what's new and what's really been going on in my head around cost savings and VoIP for businesses in the economic downturn? My Asterisk PBX now talks Skype, so as a small business I'm now always online, well virtually anyway. My Aeonvista skype account can be connected to my PBX which customers, friends and family can now skype me for a VoIP call and my PBX can do all that clever find-me follow-me routing and even play and IVR message or leave a voicemail, which can be emailed to me anywhere. My Oracle Contact Centre Anywhere application can now call out and receive incoming calls from Skype, so I can do agent based routing and screen pop for calls coming in over skype. For Site to Site traffic I also have a cool NAT savy, encrypted, VoIP VPN. For travelling when I would have used my IAX softphone to get through those double NAT Hotel hotspots to phone home for free, I can now just use skype, call my family on the house phone without needing a PC at home turned on or them all crammed around the laptop. My OpenFire IM server which has and Asterisk plug - now has a Skype plug-in, without having a Skype plugin if you follow, at least for VoIP calls, no IM sessions. But its a start. Been working closely with the CCA product for a couple of customers and been on a full time contract - so been a little strapped for time. Also been tinkering around the edges of IPv6 on my Vyatta router. I now have a 16-bit subnet of IPv6 address space - Hmm not sure what I'm gonna do with that yet, but can at least play with some OSPF v3 and MP-BGP set-up to get my head around IPv6. Also I've not got the version 5 release of the Vyatta software to play with so lots more tinkering to do. So the Office/Lab is in refurb mode, which was partly caused by a living room redecoration - I know but some how the living room refurb spread to the office. 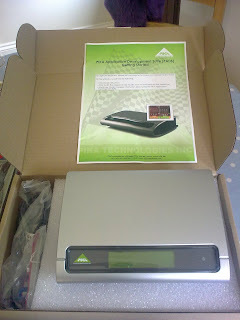 The good news is whilst the lab is down for a little while, I get to install one of these beauties from Kell Systems http://www.kellsystems.com, This means all my kit keeps cool and quiet.... That means the lab now really is a study which the family can use. Now for the wide screen Flat panel TV and AV set-up in there and we're getting there. So at least one of the ideas for cost saving got off the ground - Skype to SIP gateway that seems to work pretty well and has some other side effects in my lab.